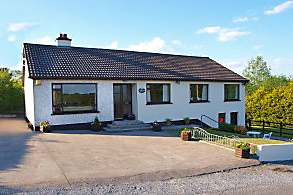 Surrounded by some of Leitrim’s top angling venues, Lake View House is located just a mile from Ballinamore – a five minute drive along a country lane. This spacious four bedroom bungalow can sleep six adults and consists of one double en-suite, two twin bedrooms and a single bedroom. There is also a shared bathroom with fitted shower. The house also boasts a fully fitted kitchen with all modern conveniences including an electric cooker, dishwasher, fridge, microwave, toaster, and deep fat fryer. Lake View House also has a large dining room and a spacious sitting room with multi-channel TV and an open fireplace. There is a separate utility room with washing machine, tumble dryer and hot and cold running water. There is also a self-contained storage area complete with bait fridges to keep your bait as fresh as possible.. Other features include private parking for multiple cars and oil central heating. There is also a welcome pack on arrival. 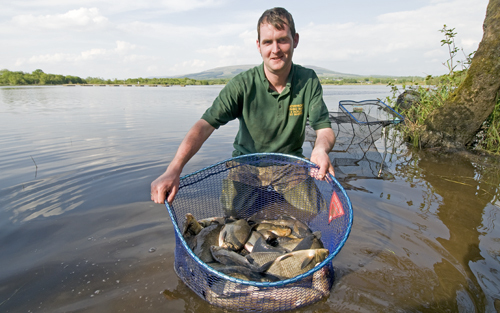 There are more than 40 lakes within a 10 mile radius covering the greatest variety of species, including several reed-fringed lakes renowned for their outstanding tench fishing where you can fish from staging. Garadice Lake is a massive fishery with some excellent stand-alone sections, such as Connolly’s Shore, Haughton’s and Church Shore, where you can expect bream, big hybrids, roach, perch and pike. House Special –A bonus is private on-site access by boat to George’s Lake where you can expect tench, bream, roach, hybrids and a large pike.